Stratovarius Community :: View topic - intermission part 2 ? Posted: Fri Jul 20, 2018 7:18 pm Post subject: intermission part 2 ? are there any Finland guys? does it mean Intermission 2 in Autumn while they are recording the new album? Yes. 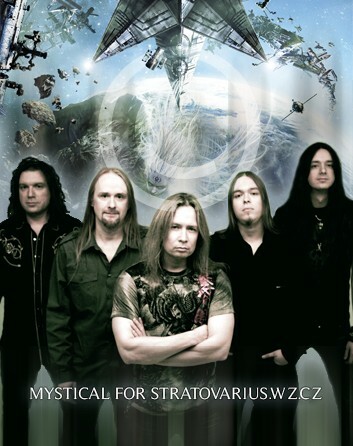 The record company wanted Stratovarius to publish a new album to promote the coming tour with Tarja Turunen. But since their new album is still so heavily in progress they desided to make Intermission Pt.2. It will contain 3 totally new songs, 4 orchestral version of older songs, some live stuff etc. No covers are expected this time. I remember there was an Intermission, Pt. 2 bootleg floated around 2006 when there was no word on the next Strato album. Was really skeptical going into this thread but it looks like the real deal. This is so cool. 2 Stratovarius albums in less than a year (hopefully). Can't wait for Intermission II! ON SEPTEMBER 28th, 2018 ON earMUSIC. First new song “Oblivion” available now. This autumn, Stratovarius will be touring all over Europe together with Tarja on “A Nordic Symphony ‘18”. I am so hyped for this! I can't wait to add this to my shelves. All those tasty bonus tracks in one nice and tidy compilation. I'm excited to hear the orchestral tunes and the other two original songs. Speaking of those, what do you all think of Oblivion? I need to hear it a couple more times. It's definitely different and more representative of 'new Strato' but it's also different even for those standards. I wonder if that's the direction they're going for on the next album, even if for just a couple songs. I would be okay with them reeling it in a bit from now on. Jens still has many years of lightning fast playing ahead of him, and Timo is not old but I just checked and he's 49! (That makes ME feel old and I'm 27) I don't want to see him go the way of James LaBrie, for example. In fact, "Old Man And The Sea" for the first time on CD in "Nemesis Days" Japan Ultimate Edition, instead of Intermission II this time. Welcome back, I was wondering if you had left us for good. I saw Stratovarius live yesterday and they didn't play Oblivion. Timo said that record company hadn't told them about publishing the song so they hadn't rehearsed it. The part at 1:14-1:16, as well as the backing vocal track during the chorus, make it sound like this song was written for someone other than Timo to sing. It has to be Lauri. I need a few more listens to build an opinion. It is very different from the previous songs. I'm also going to say Lauri. Just sounds like a Lauri song. It could be Matias but it doesn't sound quite guitar-y enough, if that makes any sense. Having Last Shore and Hallowed finally on a digital quality makes me so happy. Those tracks were only included on vinyl. A couple of users have digitalized them but they were very loss. Now both have a proper official digital quality! This is a good album. Nice to have the bonus tracks together, the new songs sound great, and the orchestral versions of the 4 older songs are incredible. Brilliant work, Strato.